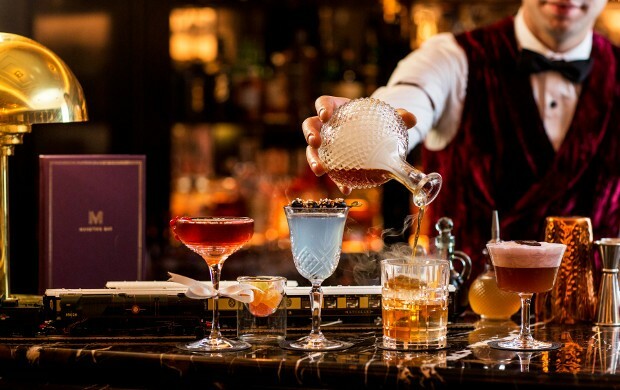 Hidden away in the subterranean level of the stylish-but-inconspicuous Flemings Mayfair Hotel lies a sumptuous drinking den that feels both secretive and trendy at once. Of course, I’m talking about the iconic Manetta’s Bar, the former 1930s haunt of artists and literati that now plays host to besuited businessmen and well-heeled hotel guests. Boasting a slew of utterly beguiling craft cocktails and a small-but-satisfactory bar food menu, this bejewelled basement bar has lost precisely none of its original charm. High style meets vintage glamour at Manetta’s—and the effect is delightfully transformative, effectively sensual, and seriously luxurious. Composed by interior design firm Tully Filmer Ltd, the 55-seat bar features eye-catching portraits by British artist Kate Boxer of the famous Manetta’s crowd, including Agatha Christie, James Joyce, and Gertrude Stein and her partner, Alice B. Toklas. Velvet, gunmetal-grey sofas slink sensually in the corners; the low, coffered ceiling with golden, recessed lighting blankets the space in warmth and intimacy (along with plush geometric carpeting), and rose-gold accents usher forth old-world lavishness and discreet sophistication. The oversized black lamps soak the den in a snug, mysterious glow: the perfect lighting for confessing secrets or concocting plots. If you’re in the mood for a little nibble with your cocktails, Manetta’s has you sorted with a basic-but-upscale bar food menu touting snacks like Seabass Ceviche (£10), Mushroom Arancini with Truffle Mayonnaise (£7), and a Charcuterie board (for two; £18). Should you be craving something more considerable, you can’t go wrong with the hearty, bacon-festooned Flemings Burger with Fries (£18). The ultra-juicy, extra-thick sirloin burger can barely be contained by its bun, and at a (rather pink) medium, it’s hard to eat this excellent burger gracefully—but manners be damned when a simple burger and fries are this good. It is a bar, so don’t expect a full menu, and really, seeing as Ormer is literally a few steps away, this isn’t a massive problem. Call me a snob, but I’m getting tired of my cocktails served in birdcages, within clouds of herb-infused smoke and a ridiculous candy floss garnish. A good drink doesn’t need all that smoke and mirrors (literally) and Manetta’s—mercifully—gets this. The Signature Cocktails (£16) are broken down into The Realists and The Fantasists, followed by a lineup of standard Classic Cocktails, Spirits, and even an impressive range of Baijiu, a 600-year-old Chinese spirit made from sorghum (a cereal grain) and ”regarded as a drink to mark celebrations and strengthen bonds” (or so claims the menu). Stripped of the bells and whistles that other mixologists lean on to establish specialness, Manetta’s Signature Cocktails are spectacular and creative through flavour alone. Endless Night (Remy Martin 1738 Cognac, Apricot Liqueur, Red Wine, Cherry Bitters) is a must. The colour of a polished ruby, it’s tart and singular. It’s also robust and generously served—the drink goes to the rim of the cut-crystal glass. The Lost Generation (Johnny Walker Black Whisky, Canton Ginger, Cocchi Sweet Vermouth, Old-Fashioned Bitters, Talisker 10yo) is a close runner-up, a striking blend of smoke and fire from the peaty Talisker and the ginger’s heat. The drink’s monikers present a nice common literary thread, without being too kitschy. Service—delivered by a fleet of gentlemen in crimson velvet blazers—is swift and sociable. And this team is knowledgeable; they’re quick to offer considered counselling (though I suspect it’s hard to go wrong on this list of swanky sips). A tucked-away opulent hotel drinking den for classy cocktails.